Because a changing administration shouldn't change the facts. There are a plethora of debates currently going on in the sciences. For example, what is dark matter? Can we ever hope to achieve faster-than-light travel? Will we terraform Mars or bring the hyperloop to life? Science is full of questions. But one thing that it’s not questioning? Anthropogenic climate change, or, as it’s more commonly known, manmade climate change. Let’s be clear: Global warming is real, and we’re causing it. While scientists do debate the various processes related to the rate and effects of our warming planet, they do not debate whether or not humans are having a negative impact on the environment and warming the world. 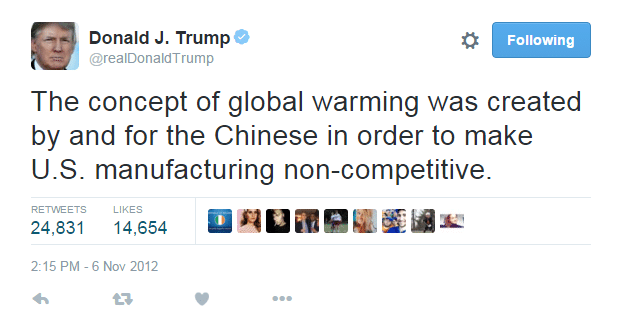 Despite all the (very clear) assertions by scientists, we somehow have an administration that thinks that climate change is a Chinese hoax (it’s not) and that the scientists have skewed data (they haven’t). This is certainly cause for some alarm. But there’s something you can do to help. The group consists of the Penn Program in Environmental Humanities and the Penn Libraries, who are working in collaboration with researchers and professors at the University of Toronto to build a “toolkit” that anyone can use in order to host their own DataRescue event. A hackathon is scheduled for this weekend in Toronto in order to build this toolkit, so if you care about data or the environment, well, now is a good time to take some real action. The event is taking place from 10 a.m. to 4 p.m. on December 17 (tomorrow). Of course, there are a host of other ways you can support the effort. Head here to learn more.